Draft: 2005, Pittsburgh Pirates, 8th rd. Full name is Steven Wayne Pearce. He and his wife, Jessica, have a daughter, Jensen, and a son, Crew. Grew up a Red Sox and New England Patriots fan because of his father's Massachusetts roots...Played baseball at Indian River State College (2002- 03) in Fort Pierce, FL, then at the University of South Carolina (2004-05)...Led the Gamecocks in AVG, HR, and RBI in each of his 2 years, totaling 42 HR with 133 RBI. As a senior in 2005, was a Baseball America SecondTeam All-American, Second-Team All-SEC selection, and the NCBWA District IV Player of the Year. Was inducted into the Indian River Athletic Department's Pioneer Hall of Fame on 4/16/15...Totaled 17 HR in his 2 years with the team, leading the Pioneers in AVG in 2002 and 2003. Was selected in the 45th round of the 2003 June Draft by MIN and in the 10th round of the 2004 draft by BOS, but did not sign...Was then signed by PIT as an 8th-round selection in 2005. Is a 2001 graduate of Lakeland (FL) High School. Split the season between TOR and BOS, hitting .284/.378/.512/.890 with 11 HR in 76 games. His .890 OPS ranked 9th in the AL among players with 250+ PA, after Mike Trout, Mookie Betts, J.D. Martinez, Manny Machado, José Ramírez, Alex Bregman, Shohei Ohtani, and Aaron Judge. Drove in 42 runs, his 2nd-highest season total (49 in 2014)...Recorded an RBI every 5.12 AB (215 AB). Between the 2 clubs, made 28 starts at 1B, 19 at DH, 7 in LF, and 2 in RF...Made just 1 error in 216 chances (.995 fielding percentage). Hit .304/.400/.559/.959 in 120 PA vs. LHP (31-for102, 9 2B, 3B, 5 HR, 20 RBI, 14 BB). With RISP, hit .368 with a .441 OBP, .684 SLG, and 1.125 OPS (21-for-57, 3 2B, 5 HR)...Among players with 50+ AB with RISP, ranked 9th in the majors in AVG, 8th in SLG, and 9th in OPS...Hit 7 game-winning HR, tied for 7th-most in the AL... Had 3 game-winning HR with TOR and 4 with BOS. Drew 29 BB compared to just 41 SO, a career-best BB/ SO ratio of 0.71 (min. 20 G). 6 of his HR and 14 of his 42 RBI came with 2 strikes. Hit 5 HR vs. NYY, all with BOS, including 4 over a 2-game span (8/2-3)...Became the 2nd Sox hitter ever with 4 HR over a 2-game span vs. NYY, joining David Ortiz (7/4-5/03). Hit .328/.392/.552 in 26 games for the Blue Jays before being acquired by BOS on 6/28. Recorded a .901 OPS in 50 games with the Red Sox, batting .279 (38-for-136) with a .394 OBP, .507 SLG, 19 R, 8 2B, 3B, 7 HR, and 26 RBI. Drove in 13 runs in April, slugging .500 over 18 games (.276/16-for-58, 12 R, 4 2B, 3 HR). His 1st hit of the season was a pinch-hit double on 3/30 vs. NYY, his 200th career XBH. Scored a run in a career-best 7 straight games from 3/30-4/9 (7 R), homering 3 times over that span. Homered in 3 straight games for the 1st time in his career from 4/7-9. On 4/8 at TEX, hit his 1st career leadoff HR...Became the 15th Blue Jay to homer on the 1st pitch of a game. On 4/9 at BAL, collected his 500th career hit in the 2nd inning (single)...In his next PA, hit a 2-run homer. Placed on the DL from 5/3-6/21 with a left oblique strain...Played in 4 rehab games for Triple-A Buffalo. From 6/22-8/3, posted a .362/.444/.710 batting line over 23 games, recording 6 of his 11 HR and 17 of his 42 RBI. On 6/23 at LAA, broke a 1-1 tie in the 9th inning with a 3-run homer...Was his first go-ahead hit in the 9th or later since a walk-off grand slam on 7/30/17 vs. LAA. Dealt to BOS with cash considerations in exchange for minor league INF Santiago Espinal on 6/28. In 67 PA vs. LHP after joining BOS, hit .302/.433/.585 (16-for-53, 4 2B, 3B, 3 HR, 10 BB)...In his first 13 games with the Red Sox, went 15-for-37 (.405) with 7 runs, 5 2B, HR, 6 RBI, and a 1.099 OPS...Hit .571 (8-for-14) with 3 2B and a HR vs. LHP in that time. Made his Red Sox debut on 6/29 at NYY (2-for-4, 2B). Hit his 1st HR for BOS on 7/9 vs. TEX...Became the 1st Red Sox hitter with a HR in his 1st at-bat at Fenway as a member of the team since Daniel Nava's 1st-pitch grand slam on 6/12/10 vs. PHI. Reached base in a season-long 10 straight games from 7/6-27, batting .400 (12-for-30, 3 2B, HR, 5 RBI). In 3 games from 7/6-9, went 7-for-11 (.636) with 4 runs, 2 2B, HR, and 4 RBI. Hit a career-high 3 HR and drove in a career-high 6 runs on 8/2 vs. NYY...Led off the 3rd with a HR, hit a goahead HR in the 4th, and added a 2-run HR in the 6th. Became the 3rd Red Sox hitter with a 3-HR game vs. the Yankees, joining Mo Vaughn (5/30/97) and Kevin Millar (7/23/04). Hit a game-winning HR on 8/3 vs. NYY, becoming just the 2nd Red Sox hitter ever with 4 HR over a 2-game span vs. NYY (also David Ortiz, 7/4-5/03)...His 4 HR were his most over a 2-game span in his career. On 9/11 vs. TOR, hit an RBI triple in the 7th inning, his only triple of the season and his first RBI triple since 8/11/12 with HOU vs. MIL. Hit a 2-out, first-pitch grand slam off J.A. Happ in his final game on 9/28 vs. NYY...Was his 4th career grand slam, his first since hitting a pair of walk-off grand slams over a 4-day span on 7/27/17 vs. OAK & 7/30/17 vs. LAA. His grand slam was his 2nd career grand slam off J.A. Happ and 6th career HR off the LHP, more than any other hitter and his most vs. any pitcher. Finished the game on 9/28 vs. NYY with 5 RBI...Was his 3rd career game with 5+ RBI, 2 of which came over a span of 6 games vs. NYY. POSTSEASON: Named World Series MVP...Appeared in 13 of the Sox' 14 postseason games, reaching base via hit or BB in each of them...Hit .289 (11-for-38) with a 1.083 OPS, 4 HR, 11 RBI, 12 R, and 9 BB against 8 SO. Started 11 games at 1B, with BOS going 10-1 in those. Recorded at least 1 hit and scored at least 1 run in each of his first 6 starts...The only other Red Sox player ever to do that in 6 consecutive starts in a single postseason is Mike Lowell (2007). In Game 3 of the ALCS, broke a 2-2 tie with a solo HR in the 6th inning of an eventual 8-2 victory at HOU. Named MVP of the World Series after recording 3 HR, 8 RBI, and a .500 OBP against the Dodgers..His 3 HR in the World Series tied the Red Sox franchise record for most in a single Fall Classic (Carl Yastrzemski hit 3 HR in 1967)...His 8 RBI were 2nd-most by a Sox player in a World Series (Dwight Evans, 9 in 1986). Is 1 of 17 players ever to record 3+ HR and 8+ RBI in a single World Series, and 1 of only 8 to reach those totals and have a .500+ OBP in that same Fall Classic. In Game 4 of the World Series, tied the score at 4-4 with a solo HR off Kenley Jansen in the 8th inning, then added a 3-RBI double in the 9th. In Game 5, helped the Sox clinch the World Series title with 2 HR, including a 2-run shot off Clayton Kershaw in the 1st inning. Became the 3rd player in postseason history with at least 1 HR and 3 RBI in consecutive World Series games, joining Babe Ruth (1927) and Lou Gehrig (1928). Became just the 3rd player in MLB history with two walk-off grand slams in the same season (Cy Williams-1926, Jim Presley-1986) ... On July 27 vs. OAK, became the first player in nearly three years to hit a game-ending, extra-inning grand slam after going hitless to that point in the game...Two players did it in 2014: Nick Swisher for the Indians and Ramon Santiago for the Reds (courtesy of Elias)...Won the game in the 10th inning, Toronto's then 3rd walk-off slam in club history (Gregg Zaun - Sept. 6, 2008 vs. TB, 13th inning; George Bell - Sept. 4, 1988 vs. TEX, 9th inning)…Marked his then 2nd career grand slam and his 1st walk-off HR…It was also just the 3rd time a Blue Jay had hit a grand slam in extra innings (G. Zaun - Sept. 6, 2008 vs. TB and G. Bell - July 9, 1985 vs. SEA) ... On July 30 vs. LAA, capped a dramatic ninth-inning comeback with a walk-off grand slam off Bud Norris as the Blue Jays overcame a 10-4 deficit to earn an 11-10 victory, the largest ninth-inning comeback in team history...This came just three days after his walk-off slam in the Jays' 8-4 win in 10 innings against the Athletics...That marked the shortest span between walk-off grand slams by any player in Major League history, the previous shortest being 100 days by the Mariners' Jim Presley in 1986...It was also his 3rd career grand slam and Toronto's 4th walk-off slam in club history…It also marked his 2nd career walk-off HR ... Hit seven of his 13 HR when leading off an inning…13 of his 23 hits when leading off an inning went for extra-bases ... Hit .323 (10-for-31) with three doubles and three home runs (.400 OBP) in plate appearances with RISP and two out ... Played 10 games at 1B (five starts) and 85 games in LF (77 starts) while hitting as DH twice (both as a starter) ... Collected three hits on Opening Day (Apr. 3 at BAL), the most in his career for a first game of the season...Had two hits in his MLB debut on Sept. 1, 2007 but never had more than one since ... Collected four hits to match a career-high on May 2 at NYY (also July 3, 2014 vs. TEX), including his first two home runs as a Blue Jay, his 5th career multi-HR game ... Left the game on May 14 vs. SEA after hitting a double in the 2nd inning ... Was placed on the 10-day DL on May 15 with a right calf strain...Appeared in six games as part of a rehab assignment for New Hampshire (4G) and Buffalo (2G) where he combined to hit .091 (2-for-22) ... Hit a home run in his 1st AB after being activated from the DL on June 16 at CWS ... Put together a season-high eight-game hitting streak from May 11-June 21, hitting .462 (12-for-26) with 4-2B, 2-HR, and 9-RBI over that span ... Hit his 7th career triple on Aug. 14 vs. TB, his first since June 15, 2016 vs. SEA ... Snapped a career-long 0-for-19 drought with a double in the 1st inning on Aug. 30 vs. BOS ... Left the game in the 1st inning on Sept. 8 vs. DET with lower back stiffness and was then shut down for the rest of the season...Participated in 92 contests and has played in more than 92 games just once in his 11-year career (102G in 2014). 60-day DL with a strained right flexor mass... TOR will be his fourth AL East team after spending time with BAL, TB and NYY over the last five seasons...Hit .309 with a .908 OPS in 60 games with TB in 2016…22 of his 63 hits with the Rays went for extra bases...Was traded to Baltimore on Aug. 1…Appeared in only 25 games for the Orioles before injury ended his season…In those 25 contests with the O's hit just .217 with a .729 OPS. Started 79 games (34-LF, 25-1B, 6-RF, 1-DH) and made his major league debut at 2B when he appeared in 18 games, 13 starts...filled in at 2B in May when Ryan Flaherty and Jonathan Schoop were both on the disabled list...played his first game there on May 1 at Tropicana Field…Made his fourth Opening Day roster, third straight with the Orioles, but missed 34 games with a left oblique strain, July 19-Aug 24...still hit 15 HR, including 6 in September, 2nd on the team behind Chris Davis (10)…After setting career highs in every offensive category in 2014, his numbers fell off...biggest drop was vs. southpaws...brought a .280 career average vs. LHP into 2015, but batted .196/.266/.357 after hitting .327/.405/.704 the year before. ..After hitting 25 HR in his first seven major league seasons, has hit 36 the past two seasons (including 9 vs. the Rays) despite making only 175 starts...his rate of 17.56 AB per HR over the past two seasons is comparable to OAK/TOR Josh Donaldson (17.54) and CHC Anthony Rizzo (17.62) over the same period…Was the only American Leaguer to hit a home run in the first 2 games of the season, both in wins at the Trop...homered off Chris Archer on Opening Day and Nathan Karns the next day…Hit 4 HR at Tropicana Field and has hit 7 there the past two years, 2 more than any visiting player...with 7 career home runs in 73 AB at the Trop, has the best all-time AB per HR ratio (10.43) of any player (min. 20 games)...is a lifetime .288/.395/.644 (21-for-73) at Tropicana Field...among all players with as many at-bats at Tropicana Field, only Travis Hafner has a higher career SLG (.648)…Has twice as many career home runs vs. the Rays (10) than any other opponent, with all 10 coming in his last 118 AB...had the third multi-homer game of his career, first vs. the Rays, on Sep 18 at TB in Baltimore's 8-6 loss...homered off Drew Smyly and Brad Boxberger…Hit his first career grand slam off J.A. Happ on May 21 vs. SEA in a 5-4 win. Made the Opening Day roster and was with the O's through April 22 when he was DFA...Released on April 25 and signed back with the O's on April 29...Set career-highs in games (102), plate appearances (383), runs (51), hits (99), doubles (26), HR (21), RBI (49), SB (5), walks (40), SLG (.556) and OPS (.930)...Joined Adam Jones and Nelson Cruz with 20-double/20-HR seasons for the O's...Named co-AL Player of the Week (with Jones), June 30-July 6 (.333; 10-for-30, 2BB, 2-2B, 3HR, 8R, 9RBI)...Hit safely in a career-high 11 straight games, August 17-28, batting .333/.375/.778 (15-45) with 10 extra-base hits (5-2B and 5 HR)...Batted .327/.405/.704 in 111 plate appearances vs. LHP...Hit .329/.416/.600 with 12 HR in 51 games at OPACY...Batted .319/.390/.569 with 28 RBI in 82 PA with RISP...Hit 1st career PH HR, May 27 @MIL, the O's 1st PH HR since Luke Scott, April 18, 2011 vs. MIN...Collected career-high four hits July 3 vs. TEX, going 4-for-5 with 2-2B, R, 2RBI & a career-high 2SB...Posted his 2nd career multi-HR game, going 2-for-3 with BB, 2HR, 2R, and a season-high tying 4RBI, September 17 vs. TOR (also June 30 vs. TEX)...Started all seven postseason games, batting .148/.233/.185 with a double and an RBI in 30 plate appearances. Made 1st O's Opening Day roster and went 0-for-4 in 1st career Opening Day start, April 2 @TB... Was 0-for-17 to open the season before homering off Jake McGee, April 18 vs. TB... Tied career-high (4th time) with three hits, including 10th inning game-winning RBI, May 4 @LAA... Tied season & career-high (5th time), with three hits, June 9 @TB... Had two DL stints stemming from left wrist tendinitis, June 20-July 31 and August 28-September 17... Batted .455/.625/1.000 in 16 plate appearances after his second DL stint to end the season. Had two stints with the Orioles, June 2-July 21 and September 29-end of season ... Went to spring training with Minnesota...Was released and signed to a minor league contract by the Yankees (March 29)...Wasacquired by the Orioles (June 2)...Designated for assignment by the Orioles (July 21)...Claimed on waivers by Houston (July28)...Designated for assignment by Houston...Claimed on waivers by New York (August 27)...Designated for assignment andclaimed by Orioles (September 29) ... Posted three multi-hit games in a four-game span, June 13-16 ... Career-high five RBI and hit his first Oriole home run June 14 vs. Pittsburgh ... Batted .254/.321/.437 with three homers and 14 RBI in 28 games from June 3-July 20 ... Reached safely in 18 of 26 games with an at-bat ... Hit a three-run homer July 6 at Los Angeles (AL), the only runs in a 3-2 win ... Went 1-for-4 and started in RF in O's debut, June 3 at Tampa Bay ... Also played in 21 games for Houston and 12 for the Yankees. Made Pittsburgh's Opening Day roster for the first time in his career and made season debut in fourth game, April 4 at St. Louis and played final inning at first base...Made his first career appearance at third base, April 9 vs. Colorado...made his first start, April 14 vs. Milwaukee (third base)...Appeared in second spot of starting lineup for first time in his career, going 3-for-5 with a homer and two rbi, May 25 vs. Atlanta...Placed on 15-day disabled list with a right calf strain, May 29-July 22...went on rehab assignment, playing three games with Single-A Bradenton and one game with the GCL Pirates and seven games with Triple-A Indianapolis...reinstated, July 22...Placed on the 15-day disabled list, August 23 with a broken right index finger and didn't play again...Transferred to 60-day disabled list, September 14...Hit .291 (16-for-55) with 10 rbi in 28 games before the All-Star break and .077 (3-for-39) with no rbi after the break...Made 16 appearances (nine starts) at first base, 10 appearances (seven starts) at third base and five appearances (two starts) in right field with Pittsburgh...made two errors (one fielding and one throwing) while playing third base, one throwing error at first base and one fielding error in right field. Began season with Indianapolis (AAA), where he reached base safely in 21 of his first 23 games (thru 5/3) priorto his recall by Pittsburgh on 5/4...Hit safely in each of his first seven games, going 12-for-29 (.414) with six doubles and a homerun...Walked four times in five plate appearances on 4/22 vs. Louisville...Went 4-for-4 on 4/25 at Louisville to raise season averageto .417...Made 20 appearances at first base and three in right field while starting the season with Indianapolis...Made first start withBucs at first base on 5/5 vs. Chicago (NL) and went 0-for-3...Went hitless in his first six at bats with Pittsburgh before going 1-for-3in second start on 5/8 vs. St. Louis...Tallied first RBI, but left his start on 5/14 at Wrigley Field with posterior right knee soreness...Hadcareer-high three hits, including two doubles, on 5/19 vs. Milwaukee...Had a two-run triple on 5/20 vs. Milwaukee...Suffered a rightankle sprain on 5/24 and was placed on the 15-day disabled list on 5/25...Made all 11 appearances (nine starts) with Pittsburgh atfirst base...Played two games on rehab assignment with Bradenton in the Florida State League on 6/17-18...Had rehab assignmenttransferred to Indianapolis on 6/19 and went 12-for-43 (.279) with a homer, seven RBI and four stolen bases with Indians thru6/30...Underwent arthroscopic surgery on 8/4 to repair the patella tendon in his left knee (procudure performed by Dr. Patrick DeMeoin Pittsburgh). Split season between Triple-A Indianapolis andPittsburgh, where he established career highs in nearly every offensivecategory...Began season with Indy and went 3-for-32 (.094) in his first ninegames thru 4/17...Hit safely in next three games from 4/21-23, which includeda four-hit performance on 4/23 at Columbus...Reached base safely in 14straight games from 4/21 thru 5/5 and in 30-of-31 from 4/21 thru5/23...Homered in back-to-back games on 5/7-8 and hit three home runs ina four-game span from 5/5-8...Had second four-hit game and scored fourruns on 5/20 vs. Pawtucket...Snapped a 29-game homerless streak with twobombs on 6/9 at Buffalo...Homered in consecutive games again on 6/17-18...Was recalled by Pittsburgh on 6/20 when Craig Monroe was designatedfor assignment...Made season debut with the Pirates on 6/21 at Colorado andwent 0-for-2 with a walk while making start at first base...Made loneappearance/start in right field on 6/23 vs. Cleveland...Pinch hit and playedfinal inning at first base on 6/24 vs. Cleveland...Went hitless in first six at batswith Pittsburgh before doubling as a pinch hitter on 6/30 vs. Chicago (NL)....Went 0-for-3 with three strikeouts against Mike Hampton in start at firstbase on 7/6 at Houston...Struck out as a pinch hitter on 7/8 at Houston andwas optioned back to Indianapolis following the game that night...Hit .333 in final 12 games with Indy, going 14-for-42 with two homers and 11 RBI from7/9-22...Was recalled by Pittsburgh a second and final time on 7/23...Hit safely in five straight starts at first base from 7/23-27 (6-for-19)...Connected offWashington's John Lannan for first home run with the Pirates on 7/31 at PNC Park...Reached base safely in 11 straight games from 8/3-17...Hit secondhomer on 8/9 vs. St. Louis off Joel Pineiro...Swiped lone base on 8/15 at Chicago (NL)...Hit safely in seven straight starts from 8/22-31, going 9-for-26(.346) with four doubles...Went 4-for-41 in his next 14 starts thru 9/26...Smacked final home run on 9/15 at Los Angeles...Batted in the cleanup spot foronly time on 9/16 and went hitless in four at bats...Hit safely in three of his last five games (3-for-10)...Tripled as a pinch hitter in final at bat on 10/4 atCincinnati...Made total of 42 appearances (41 starts) at first base and one start in right field...Had two errors (both throwing) while playing first base...Went3-for-14 (.214) with three walks and an RBI as a pinch hitter. Spent majority of season with Indianapolis, but also had three different stints with Pittsburgh...Shared Indy team lead in doubles and rankedsecond in RBI...Went 0-for-8 in first two Triple-A games before hitting safely in 12 of his next 13 contests from 4/5-17...Hit first two home runs and hadfive RBI on 4/17 vs. Pawtucket...Was hitting .238 (24-for-101) at the end of April...Went 6-for-13 with three doubles and five RBI in three game stretchfrom 5/14-17...Hit a three-run walkoff home run and went 3-for-4 with four RBI vs. Rochester on 6/20...Was recalled by Pittsburgh on 7/2...Doubled as apinch hitter in third at bat with Pirates on 7/6 at Milwaukee...Was optioned back to Triple-A on 7/8 and went 13-for-52 (.250) in 14 games before beingrecalled by Pittsburgh on 7/26 when Xavier Nady was traded...Made start in right field that night vs. San Diego and went 1-for-4 while playing five inningsin right field and four in left field...Snapped an 0-for-11 streak with a single off Brad Lidge at Philly on 8/8; also delivered game-winning double in 12thinning on 8/8...Had two hits, including game-winning single at New York (NL) on 8/11...Was optioned to Indianapolis on 8/22 and hit .182 (6-for-33) witha home run and six RBI in final 10 Triple-A games...Made 69 appearances in right field and 32 at first base while playing with Indianapolis...Also went 4-for-24 with a homer in six games as the designated hitter...Was recalled by Pittsburgh a third and final time on 9/2...Made start in right field on 9/4 atCincinnati and had two-run single in first at bat...Hit first Major League home run in 137th career at bat on 9/9 at Houston - a solo shot off Randy Wolf...Batted.275 with four homers and eight RBI in 17 games after being recalled in September...Started each of the final six games in right field and went 8-for-25(.320) with three home runs...Hit .309 in his last 15 starts with Pittsburgh (dating back to 8/16), going 17-for-55 with four homers...Made a total of 27starts in right field for the Pirates and committed two errors (one fielding/one throwing)...Had lone assist on 8/4 at Arizona...Played Winter Ball in Mexicoand hit .203 (12-for-59) with seven RBI in 18 games with Mazatlan. Hit .328 with 45 doubles, 31 home runs and 119 RBI in 157 minor/major league games...Was namedMinor League Player-of-the-Year by MiLB.com and captured the J.G. Taylor Spink Award as the Topps/Minor League Player-of-the-Year....Combined to hit .333 with 31 home runs and 113 RBI in 134 minor league games between Lynchburg (A), Altoona (AA) andIndianapolis (AAA)...Ranked third among all minor league players in total bases (303), fourth in RBI, fifth in extra-base hits (75),fifth in slugging percentage (.622) and tied for seventh in home runs...Led all Pittsburgh farmhands in home runs, RBI and extrabasehits (75)...Became first position player in the Pirates organization to make the jump from Class-A to the major leagues in thesame season since catcher Yamid Haad in 1999...Began season with Lynchburg. ...Was named Carolina League Player-of-the-Week forthe week of 4/23-29 after hitting .484 (15-for-31) with eight homers and 16 RBI in seven games...Set a Hillcats record by homeringin five straight games from 4/21-26...Finished his tenure in Lynchburg with an 11-game hitting streak and a club-record sevenconsecutive multiple-RBI contests...Hit two home runs in his final game with the Hillcats on 4/29 at Myrtle Beach, giving him ninelongballs in an eight-game span from 4/21-29...Made all 18 defensive appearances with Lynchburg at first base....Was promoted toAltoona on 5/1 and led team in RBI despite playing just 81 games...His .334 average with Altoona was the second-highest, singleseasonbatting average in Curve history (Jeff Keppinger's .338 average in 2004 is the club record)...Made debut with Curve as apinch hitter on 5/1 at Connecticut...Homered in his first at bat of his first start on 5/2 at Connecticut...Posted an RBI in six straightgames from 6/2-8 (11 RBI total)...Had five RBI on 6/7 at New Britain...Hit .465 (20-for-43) with five homers and 21 RBI during an11-game hitting streak from 5/31 to 6/13...Hit grand slam on 6/13 vs. New Britain...Batted .404 (40-for-99) with eight home runsand 34 RBI in 27 games during the month of June and was named Eastern League Player-of-the-Month...Was named to Eastern Leaguemid-season All-Star team and struck out in lone plate appearance on 7/11 in Norwich, CT...Represented the Curve and Pittsburghorganization at the annual MLB Futures Game on 7/8 at AT&T Park in San Francisco - he went 0-for-1 with a walk in two plateappearances for the U.S. Team...Tied Ronny Paulino's team record by reaching base safely in 33 consecutive games from 6/15 thru7/22...Batted .371 (72-for-194) with 12 homers and 59 RBI over his last 52 Double-A games...Made all 77 defensive appearancesat first base while playing with Altoona...Was named Altoona's Most Valuable Player and was leading the Eastern League in both battingaverage and slugging percentage at the time of his promotion to Indianapolis on 7/30...Homered in fourth Triple-A game on8/1 at Richmond (game two)...Hit safely in six straight games from 8/4-10 (10-for-23, .435) and homered in three straight from8/7-9...Made first career appearance in right field on 8/8 at Louisville...Had back-to-back three-hit games on 8/15-16...Became firstIndy player to register six RBI in a game on 8/16 at Durham, going 3-for-5 with a double and a pair of two-run homers in the contest...Did not homer and tallied just two RBI in final 16 games with Indianapolis (57 at bats)...Made 21 appearances at first baseand 10 in right field with Indy and made one error at each position...Had contract purchased by Pittsburgh on 9/1...Made majorleague debut as a starter in right field in Milwaukee on 9/1 and singled off Dave Bush in second at bat...Picked up two hits indebut before going 1-for-10 in next three games...Tripled and tallied first major league RBI on 9/3 at St. Louis...Swiped first of twobases on 9/4 at St. Louis...Hit safely in six of his seven games from 9/7-15, raising average from .227 to .311...Swiped second bagon 9/14 at Houston...Reached base safely in 15 of his 18 starts with the Pirates, making 16 starts in right field and two at firstbase (9/3 at St. Louis and 9/15 at Houston). Combined to hit .273 with 26 home runs and 98 RBI in 131 games between Hickory (A) and Lynchburg...Led all Pittsburgh minor leaguers in home runs and was second in RBI behind Brad Corley (100)...Began season with Hickory (A)...Made 39 appearances at first base and two starts as the designated hitter...Hit .314 (37-for-118) against right-handed pitchers and .214 (9-for-42) against lefties...Recorded two five-RBI games and a pair of four RBI contests with the Crawdads...Went 3-for-4 with two homers and four RBI on 4/23 at Greensboro...Was the South Atlantic League's Player-of-the-Week for the week of 4/24-30 after hitting .391 with three doubles, five home runs and 12 RBI in seven games...Posted his second two-homer game in the span of seven days and knocked in five runs on 4/30 at Lexington...Recorded four hits (4-for-5) and five RBI on 5/8 vs. West Virginia...Scored a season-high four runs on 5/12 at Greensboro...Was promoted to Lynchburg on 5/24 and was among the SAL's top five in home runs (12), RBI (38), slugging percentage (.606) and extra-base hits (26) at the time of the promotion...Finished season with Lynchburg...Ranked second in the Carolina League in slugging (.482) and committed the most errors among league first basemen (10)...Hit a walk-off, three-run homer to give Lynchburg a 4-3 victory in his debut with the Hillcats on 5/25 vs. Frederick...Matched a season-high with four hits on 5/29 vs. Potomac...Hit .333 (13-for-39) during the first of his two 10-game hitting streaks from 6/18 to 7/2...Finished season with a 10-game hitting streak (15-for-37, .405) to raise average from .248 to .265. Was selected by Pittsburgh in eighth round of June draft...Signed with Pirates on 6/12 and made professional debut with short-season Williamsport (A)...Led New York-Penn League in doubles and finished fourth in the league in both RBI and extra-base hits (33)...Also paced league first basemen in games played (71), total chances (718), putouts (651), assists (58) and double plays (65)...Tied for the most errors among league first basemen (9)...Was named to both the mid-season and post-season All-Star teams. ...Posted 24 multi-hit games for the Crosscutters...Hit .340 (18-for-53) against lefties and .292 (64-for-219) with all seven of his home runs against righthanders...Knocked in a season-high four runs on 7/2 vs. Hudson Valley...Was named the New York-Penn League Player-of-the-Week for the week of 8/22-28 after hitting .450 (9-for-20) with two doubles, two home runs and seven RBI in five games...Had first career two-homer game on 8/25 vs. Brooklyn...Went 3-for-7 with two RBI in two playoff contests. April 4, 2019 Boston Red Sox activated 1B Steve Pearce from the 10-day injured list. 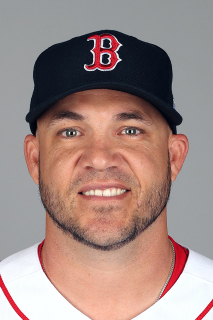 March 27, 2019 Boston Red Sox placed 1B Steve Pearce on the 10-day injured list retroactive to March 25, 2019. Left calf injury. November 16, 2018 Boston Red Sox signed free agent 1B Steve Pearce. October 29, 2018 1B Steve Pearce elected free agency. June 29, 2018 Boston Red Sox activated 1B Steve Pearce. June 28, 2018 Toronto Blue Jays traded LF Steve Pearce and cash to Boston Red Sox for SS Santiago Espinal. June 22, 2018 Toronto Blue Jays activated LF Steve Pearce. June 16, 2018 Toronto Blue Jays sent LF Steve Pearce on a rehab assignment to Buffalo Bisons. May 3, 2018 Toronto Blue Jays placed LF Steve Pearce on the 10-day disabled list. Oblique strain. June 16, 2017 Toronto Blue Jays activated LF Steve Pearce from the 10-day disabled list. June 13, 2017 Toronto Blue Jays sent OF Steve Pearce on a rehab assignment to Buffalo Bisons. June 8, 2017 Toronto Blue Jays sent OF Steve Pearce on a rehab assignment to New Hampshire Fisher Cats. May 15, 2017 Toronto Blue Jays placed LF Steve Pearce on the 10-day disabled list. December 5, 2016 Toronto Blue Jays signed free agent LF Steve Pearce. November 3, 2016 LF Steve Pearce elected free agency. November 3, 2016 Baltimore Orioles activated LF Steve Pearce from the 60-day disabled list. September 18, 2016 Baltimore Orioles placed LF Steve Pearce on the 60-day disabled list. Right flexor mass strain. August 2, 2016 Baltimore Orioles activated LF Steve Pearce. August 1, 2016 Tampa Bay Rays traded 2B Steve Pearce to Baltimore Orioles for C Jonah Heim. July 19, 2016 Tampa Bay Rays activated 1B Steve Pearce from the 15-day disabled list. July 15, 2016 Tampa Bay Rays sent 1B Steve Pearce on a rehab assignment to Charlotte Stone Crabs. June 21, 2016 Tampa Bay Rays placed 1B Steve Pearce on the 15-day disabled list. Right hamstring strain. January 28, 2016 Tampa Bay Rays signed free agent 1B Steve Pearce. November 2, 2015 1B Steve Pearce elected free agency. August 24, 2015 Baltimore Orioles activated 1B Steve Pearce from the 15-day disabled list. August 22, 2015 Baltimore Orioles sent 1B Steve Pearce on a rehab assignment to Bowie Baysox. August 20, 2015 Baltimore Orioles sent LF Steve Pearce on a rehab assignment to GCL Orioles. April 29, 2014 Baltimore Orioles signed free agent LF Steve Pearce. April 27, 2014 Baltimore Orioles released LF Steve Pearce. April 22, 2014 Baltimore Orioles designated LF Steve Pearce for assignment. September 17, 2013 Baltimore Orioles activated LF Steve Pearce from the 15-day disabled list. August 28, 2013 Steve Pearce roster status changed by Baltimore Orioles. July 31, 2013 Baltimore Orioles activated LF Steve Pearce from the 15-day disabled list. July 29, 2013 Baltimore Orioles sent 1B Steve Pearce on a rehab assignment to Frederick Keys. July 26, 2013 Baltimore Orioles sent 1B Steve Pearce on a rehab assignment to GCL Orioles. June 21, 2013 Baltimore Orioles placed LF Steve Pearce on the 15-day disabled list retroactive to June 20, 2013. Left wrist tendinitis. March 31, 2013 Baltimore Orioles selected the contract of LF Steve Pearce from Norfolk Tides. December 21, 2012 Baltimore Orioles sent Steve Pearce outright to Norfolk Tides. October 13, 2012 Steve Pearce roster status changed by Baltimore Orioles. September 29, 2012 Baltimore Orioles claimed 1B Steve Pearce off waivers from New York Yankees. September 25, 2012 New York Yankees designated Steve Pearce for assignment. August 28, 2012 New York Yankees activated 1B Steve Pearce. August 27, 2012 Houston Astros traded 1B Steve Pearce to New York Yankees for cash. July 29, 2012 Steve Pearce roster status changed by Houston Astros. July 28, 2012 Houston Astros claimed 1B Steve Pearce off waivers from Baltimore Orioles. July 21, 2012 Baltimore Orioles designated Steve Pearce for assignment. June 2, 2012 New York Yankees traded LF Steve Pearce to Baltimore Orioles. April 5, 2012 1B Steve Pearce assigned to Scranton/Wilkes-Barre Yankees. March 28, 2012 New York Yankees signed free agent 1B Steve Pearce to a minor league contract. March 27, 2012 Minnesota Twins released 1B Steve Pearce. January 3, 2012 Minnesota Twins signed free agent 1B Steve Pearce to a minor league contract and invited him to spring training. October 31, 2011 Pittsburgh Pirates sent Steve Pearce outright to Indianapolis Indians. September 14, 2011 Steve Pearce roster status changed by Pittsburgh Pirates. August 23, 2011 Pittsburgh Pirates placed 1B Steve Pearce on the 15-day disabled list. Broken right index finger. July 22, 2011 Pittsburgh Pirates activated 1B Steve Pearce from the 15-day disabled list. July 14, 2011 sent 1B Steve Pearce on a rehab assignment to Indianapolis Indians. July 13, 2011 sent 1B Steve Pearce on a rehab assignment to Bradenton Marauders. July 12, 2011 sent 1B Steve Pearce on a rehab assignment to GCL Pirates. July 10, 2011 sent 1B Steve Pearce on a rehab assignment to Bradenton Marauders. May 30, 2011 Pittsburgh Pirates placed 1B Steve Pearce on the 15-day disabled list retroactive to May 29, 2011. Right calf strain. November 3, 2010 Pittsburgh Pirates activated 1B Steve Pearce from the 60-day disabled list. August 4, 2010 Pittsburgh Pirates transferred 1B Steve Pearce from the 15-day disabled list to the 60-day disabled list. June 19, 2010 Bradenton Marauders sent 1B Steve Pearce on a rehab assignment to Indianapolis Indians. June 18, 2010 Steve Pearce roster status changed by Bradenton Marauders. June 17, 2010 sent 1B Steve Pearce on a rehab assignment to Bradenton Marauders. May 25, 2010 Pittsburgh Pirates placed 1B Steve Pearce on the 15-day disabled list. Sprained right ankle. May 4, 2010 Pittsburgh Pirates recalled Steve Pearce from Indianapolis Indians. April 4, 2010 Pittsburgh Pirates optioned Steve Pearce to Indianapolis Indians. July 23, 2009 Pittsburgh Pirates recalled Steve Pearce from Indianapolis Indians. July 8, 2009 Pittsburgh Pirates optioned Steve Pearce to Indianapolis Indians. June 20, 2009 Pittsburgh Pirates recalled Steve Pearce from Indianapolis Indians.